Farming with relatively old and traditional buildings has proven no obstacle to excellent standards of calf rearing on West Mill Farm, near Wareham, Dorset. Here, John Baggs has made limited financial facilities, but invested heavily in terms of effort and care. The result on the 290-cow milking unit is a transformation in comfort, health, growth rates, age at first calving and the calibre of heifers entering the milking herd. As a result, he was shortlisted as a finalist in the national ForFarmers competition for youngstock producer of the year. "Calves are the foundation of everything", says John, "if you get it wrong in the first two months, you are always catching up." At the centre of the operation is a steel-framed building, constructed as a hay store in the 1960s and not ideally suited to housing calves. It was used to store straw as well as calves but the ventilation was not good and young calves were sharing airspace with older animals, risking the spread of disease, and the stocking rate was too high. The consequence of this was seen in a high incidence of scouring (28%), high levels of pneumonia (45%), an average daily liveweight gain of just 0.55g/head (birth to weaning) and unacceptably high mortality at 14% (24 hours to 12 weeks). John says: "The shed was in the right location; it was close to the dairy, which was good for colostrum management, and close to calving cows, but it had to be changed for rearing calves." Colostrum management was the farm's highest priority, along with nurturing calves in their first two to three weeks of life. A computerised Lely Calm calf feeder was installed and would feed up to 60 calves. John says: "Previously, calves were having one three-litre feed, then staying on the cow for 48 hours." However, taking bloods to test for the absorption of antibodies revealed calves' immunity levels were poor and colostrum intakes needed to increase. He says: "We increased colostrum to two feeds of three litres within the first 12 hours, and removed the calf from the cow as quickly as we could after birth. Whenever we have tested calves since the change, the serum antibody level in their blood is exactly as it should be." At the same time, a Brix refractometer was introduced to measure the quality of colostrum, giving an approximation of antibody levels and milk solids. 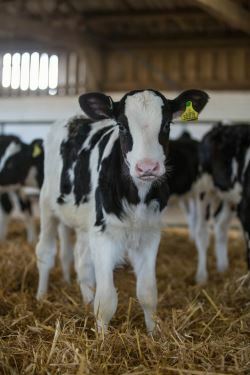 Ann Coombes, youngstock specialist with ForFarmers, says: "I recommended the calves went on to the 26% VITAMILK HiPro Heifer, because it was obvious this farm would get the best out of it. This powder has high levels of digestible dairy protein and contains a balanced amount of vitamins, minerals and trace elements, and a specialist health package called Care+." At the same time as the switch from a value to a premium milk replacer, John also made the switch to the premium creep feed, VITA Start. He says: "We find the high quality pellets early in life really stimulate rumen development. We also tried hay, as we were short of straw and found calves did really well on it. There were no pot bellies and they were chewing the cud by one month of age." Ann says: "As well as containing all of the nutrients the calf needs for frame development and health, this creep feed contains the live yeast Levucell TITAN. This live yeast stimulates early rumen development." 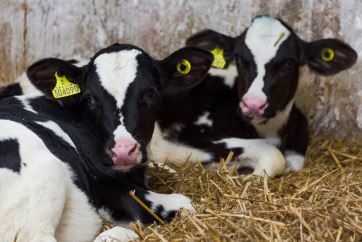 At five weeks, milk intakes start to be restricted, firstly to seven litres/day, then to six litres/day by the age of eight weeks, then down to zero by the time they are 10 weeks old. The gradual weaning gives the calves a great transition from milk to solids. Weaning may be subtle, but performance figures at West Mill Farm shout out loud, giving unambiguous evidence a transformation has occurred. Daily liveweight gain has increased from 0.55kg/day to 0.8kg/day; mortality has declined from 14% to 2%; incidence of calf scour has declined from 28% to 7%; and pneumonia has dropped from 45% to 30%. However, the latter is still a work in progress, with a positive pressure ventilation system having just been installed within the last few weeks, which is said to have made an instant impact on quality of air. John says: "Heifers coming through to the herd last year were the best we have ever had. They were bigger, stronger and nicer heifers and every time they come through, they are a bit younger and a bit higher yielding than the batch before." Achieving good calf growth rates during prolonged periods of cold weather is challenging because calves will divert energy reserves away from growth to help maintain their body temperature.